We have been using this travel system for two months and LOVE it. The sibby stroller is my favorite for maneuvering with two under two. The Litemax car seat snaps into the stroller so easily. 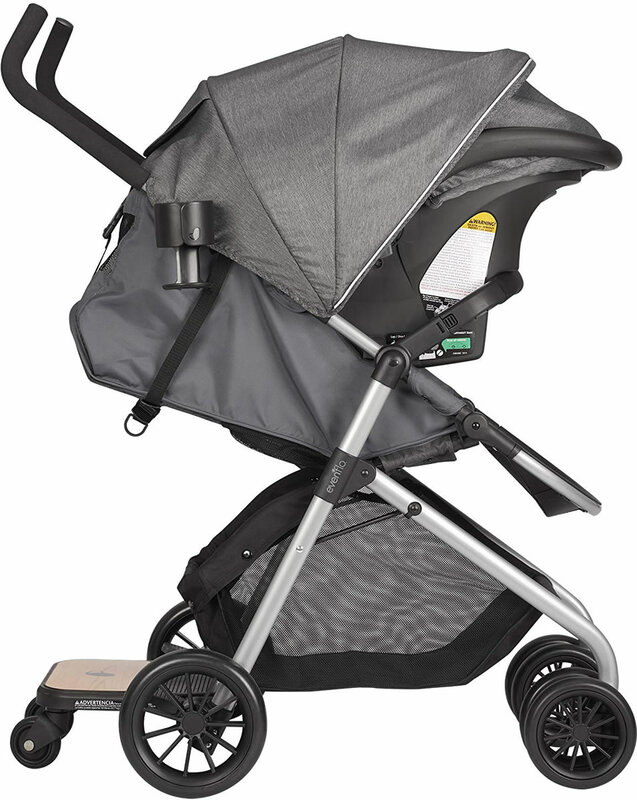 The large canopy on the stroller provides the perfect amount of shade as well. I wasn't sure about having two separate handles rather than one, but I love that you can rest your purse on one of the handles and shopping bags. It's also easy to maneuver with just one hand. My two year old loves to ride on the board that attaches so easily to the back of the stroller. It easily clips on and off giving you the option to not always use it. It folds up and expands easily as well. It doesn't have a cup holder for the toddler but the parent cup holder easily clips on and off. Sometimes I wish that was more secure though. My favorite travel system! Love the gray color too! I got this for free in exchange for my honest opinion. I was no way influenced, all thoughts are my own. 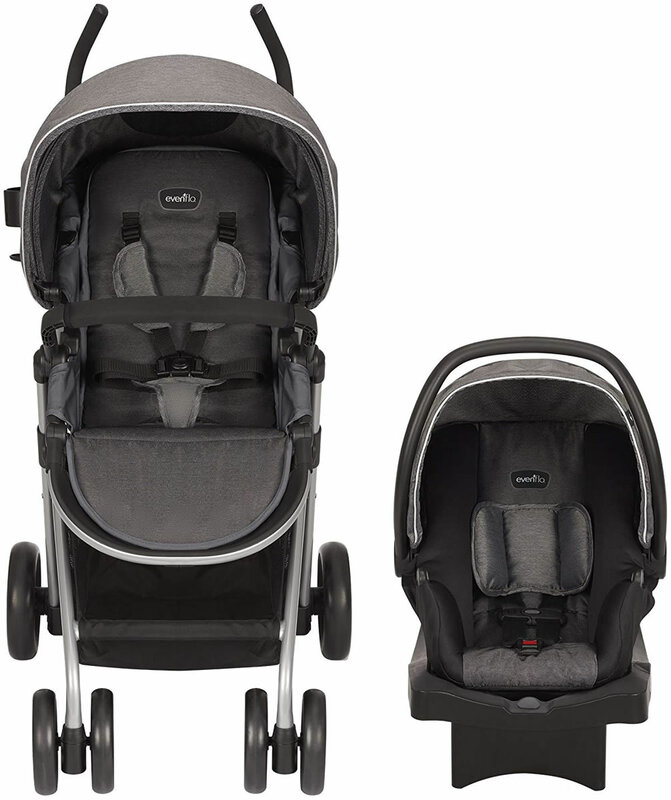 As a Evenflo brand lover I was so excited to try out this travel system! Setting up was relatively quick (about 10-15 minutes). I really love the stroller. It has a buggy board for older siblings to ride on and has a strap to hold the board up when not in use. I'm not that tall at 5' 3" and i am comfortable pushing the stroller with ease. There's a 3 adjustable leg rest, pretty full recline seat for younger babies. A niceness canopy shade, peak a boo window. HUGE stroller basket! Because we all need a big basket which you can access from the front and back. The stroller has a padded 5pt harness that is easy to adjust with no problems and a bumper bar that has fabric that can be pulled off to wash. 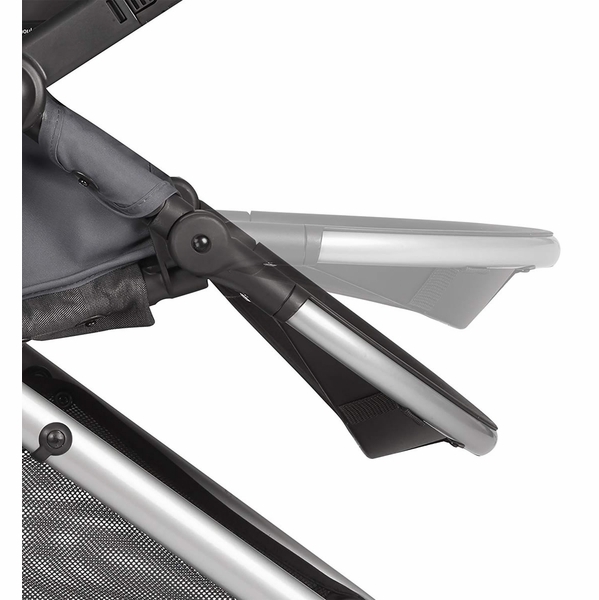 The infant seat is pretty padded, nice canopy and great height limit of 32in. While it's not my preferred infant seat because it's a none rethread but I don't mind. 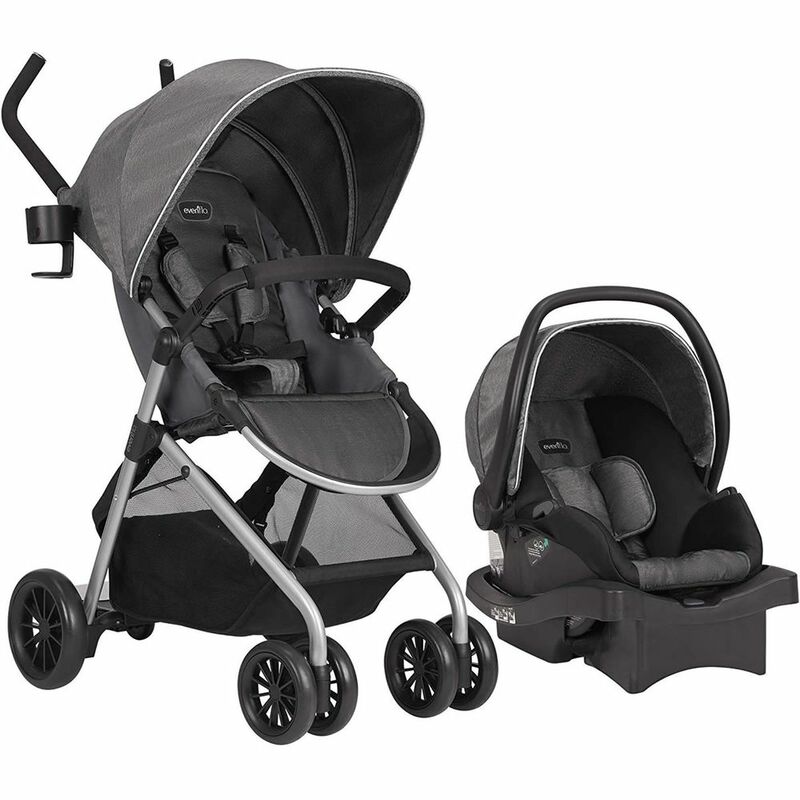 The infant base is easy to install with the lock offs and adjustable base. The stroller is easy to push with a small toddler under 40lbs but once your toddler is 40lbs it's hard to push while riding in the stroller or on the buggy. A few cons is that the way the buggy board is the child riding is in an uncomfortable angle, I would like to see the buggy board to be extendable to accommodate that unusual back bend. I would also like to see manual buttons for the leg adjuster because I have to push my kids legs up along with the leg base to lower the leg area and it is not fun. I would like to also see a peak a boo window at the lowest recline position because while my little sleeps the sun will get in their eyes which is not nice but do appreciate the extra ventilation. Adding an extra canopy panel for added coverage would be amazing to keep the sun away from little ones. My one absolute dislike is the automatic stroller locking lever. When I want to fold the stroller it is a pain to fold with how the stroller is made and trying to unfold is just as bad. 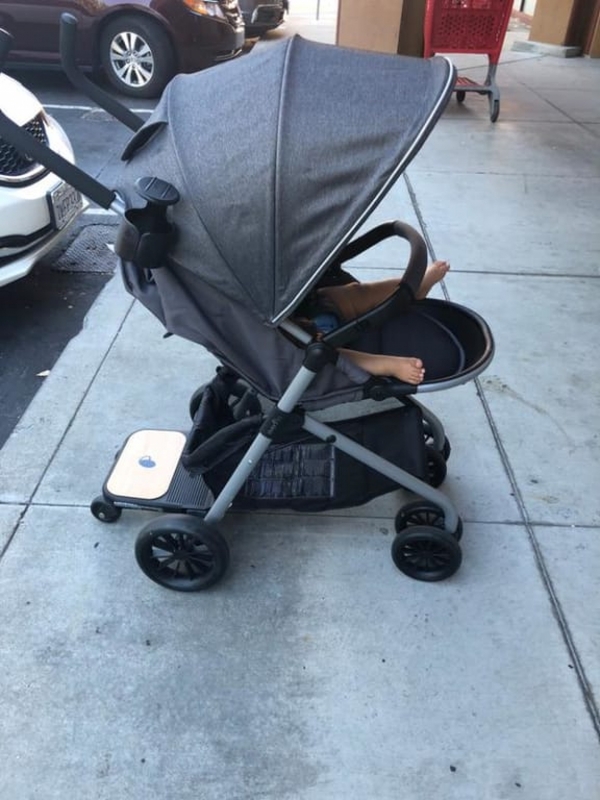 The product design team didn't see this problem when designing this stroller. I've already got my fingers stuck from trying to close and open the stroller. 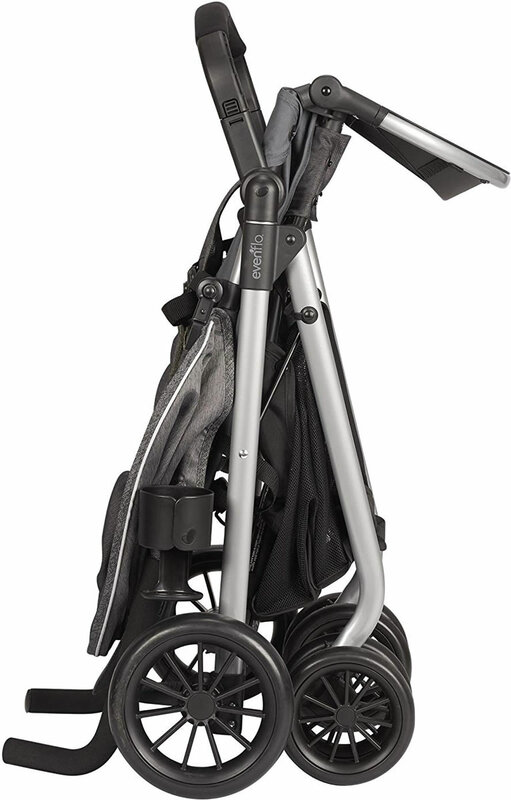 But overall this is a great compact stroller and infant seat perfect for a family with a older kid and a newborn. LOVE this combo. The car seat won't last forever because it is obviously an infant seat but the stroller can be used for a WHILE! I also love that the seat snaps into the stroller. It's amazing and my oldest loves the ride a long board that comes with it. Very light and great features! We got this stroller about a month ago. This stroller is great for traveling. It is very sturdy, even though the material it's made from is very light. 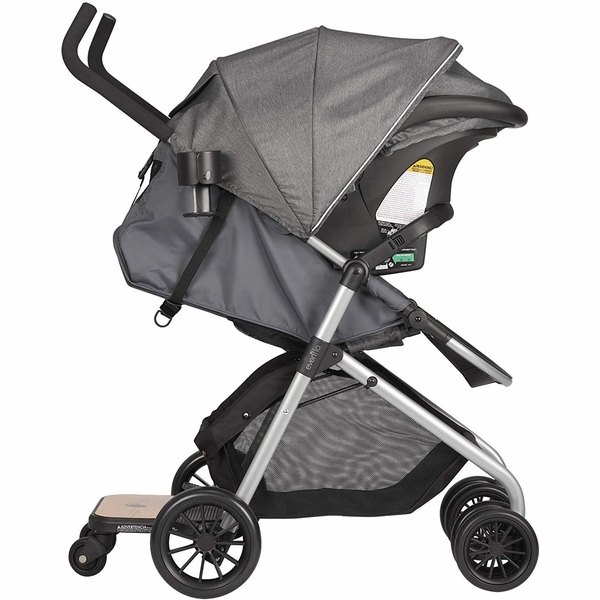 The stroller material is very light and a good size shade canopy. This stroller fits comfortably into our car and is easy to use. We especially love the size of the basket. It holds our diaper bag and other child essentials. This stroller sits my toddler comfortably and my four year old loves to ride the rolling board it comes with. I would highly reccomend this stroller if you want comfort yet trendy. I got this for my 13 months old daughter, I really like this stroller is very light weight just what I needed. At the same time is comfortable for her as well as the car seat. I love the dark grey and black color because it won't get dirty easily. It brings a cup holder and it brings an extra stand up piece for a toddler to ride- on which I think it's great! You can position it all the way back if your child is sleeping and the feet part goes up as well for more comfort. It's easy to open and close the stroller and It was very easy to put together. I'm really happy with it and would definitely recommend this stroller and car seat. I really love this travel system, however there are some little things that could be improved to bump it into perfection. First of all, stroller was very easy to put together, it took me like 10 minutes, the only thing that took me longer was trying to figure out how to fold it, which is one of my main cons. The look that this travel system has is top notch, looks like the super expensive ones but with the affordability that my family requires as a household of 5. We have owned many different infant car seats and this is by far the best one, the base is so easy to instal and it's not huge like others!! This allowed me to fit 3 car seats in a row, I have a high back booster seat from evenflo as well and a convertible from another brand, and the 3 fit perfectly in the back of my small SUV wich is great as we don't have a 3rd row. -Price, great price point for the product and the quality of it, compared to other similar travel systems. -Easy to install in the car!! -Breathable mesh in stroller, perfect for hot summer days. -Tires are great on gravel, dirt and grass which I Love because we go to a lot of Festivals andit's s perfect. -The sibling board is a great concept. -Light weight carseat which makes it really easy to handle. -The carseat stays a little more upright than others which made my baby's head fall forward while asleep. 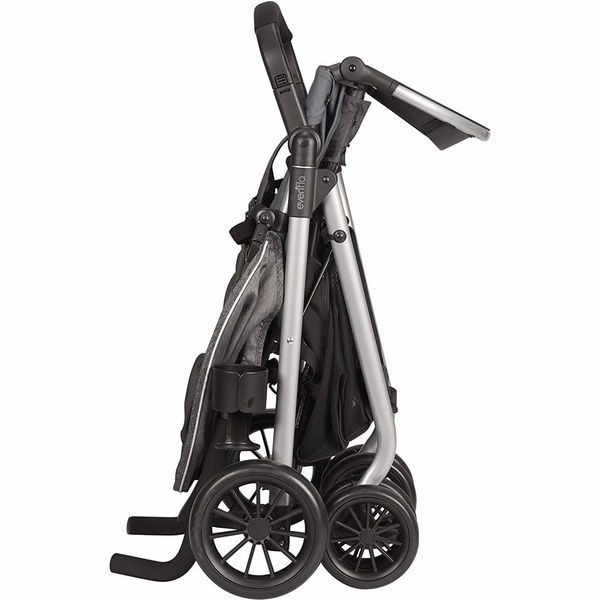 -Folding, while it is not hard to fold at all I got used to my other strollers being able to fold with the push of a button in the handle bar, also while the skate board is attached it gets a little tricky to fold. -Cup holders, it only comes with one, and the way it attaches to the stroller was so flimsy that it got lost on our very first day! Bummer, we never noticed until we bought drinks at the carnival, It could really use more cup holders maybe in the handle bar like other strollers. -While the skateboard is a great concept and really helpful with my other child, he had to be holding really tight to the parent handles as the position of the board make him lean a little backwards, making it a bit tricky for the parent to push. 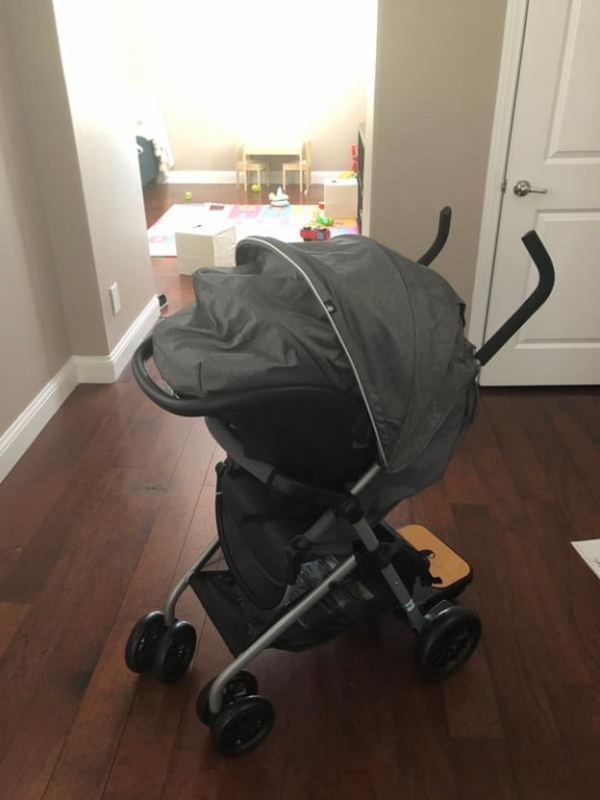 All in all I am very happy to have received this travel system, it has worked perfectly for my family and I totally recommend it to other families with multiple children as the price is great and the product is of great quality and awesome. The carseat is very lightweight and the stroller was very easy to put together and I didn't struggle to carry it either! I really like the color scheme - it's gender neutral. The stroller works better for 2 kids if you are not using the carseat as the recline blocks the board. It's a little tricky to learn to push it while the child is standing on the board and holding the handles as well, but we made it work. I like the harness as well since my son always tries to get out of the straps when they only go across his lap. I'm a little taller, so I do wish that the stroller handles were a bit taller and straighter. Overall I definately like this system and would recommend. The car seat and stroller are first rate! Very easy to assemble and open and close. My only concern would be with the sibling rider board. 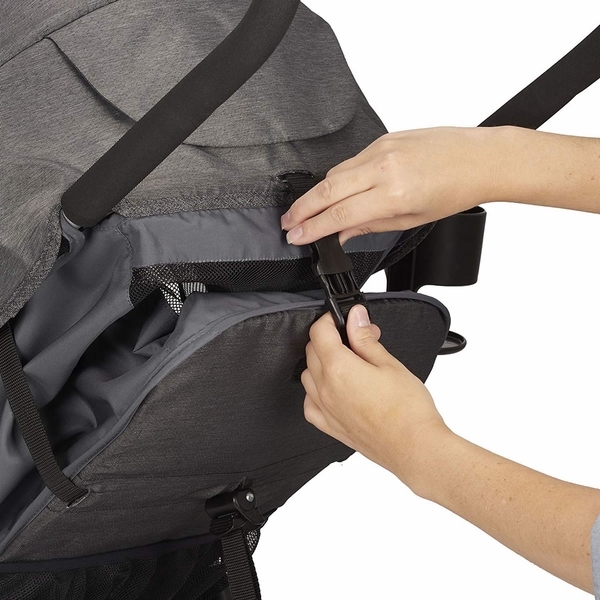 While the car seat is attached the added weight keeps the stroller stable. However when the younger child was placed in the stroller alone, it felt as if the stroller was going to tip when the toddler was riding on the board. I have so enjoyed using the Sibby Travel system! Convenient, easy, and comfortable to use! 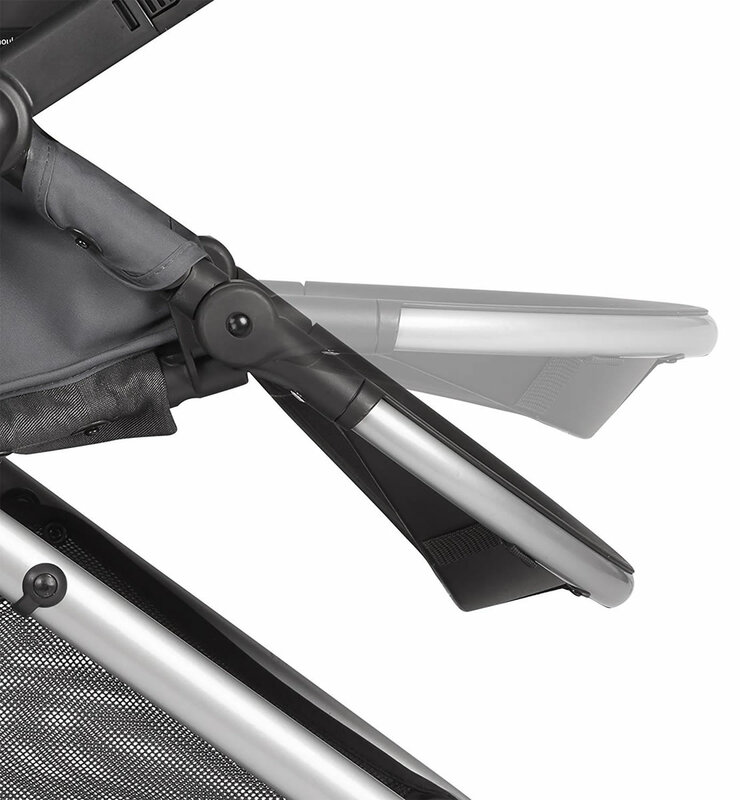 Easy to fold/unfold, snap the infant seat in and out, and comfy for little man to ride in. Highly recommend! Assembly: Opened box & assembled easily in less than 10 minutes on my own. 1st Impressions: Super light, nice looking material & design. Stroller Use: My toddler absolutely loves the independent feeling she gets riding the sibling board - it has made stroller use much easier as she would fight me overtime she had to sit in the double stroller. Other great features includes the spacious storage area, adjustable footrest for when baby is sleeping, lightweight, maneuvers well, cup holder, folds nicely and relatively compact. Carseat Use: My baby seems comfortable in the carseat. Our baby is big and may grow out of the carseat sooner than I would like. The carseat is nice and light (which is great when you have a big, heavy baby!) and attaches well to the stroller. The base is super easy to install. If I Could Make Changes: The system is light which is great, BUT this can also make it feel flimsy and cheap at times. The sibling stroller board is our favorite part BUT BE CAUTIOUS, if your child is standing on the board you must be holding the stroller bars - if not and your child leans back, the stroller will pull down and fall (as if you have heavy shopping bags hanging on the bars). All that being said, we really enjoy this stroller and it has made stroller use with our toddler much easier and more enjoyable. And the carseat is safe, cozy and lightweight. I got this about a month ago and finally have had the change to use it, it is very very easy to assemble, fold and unfold and for the size of the stroller folds down fairly small, although the car sets itself could use some improvements, the head support insert is not nearly enough to support a newborn infants head while in the car and I also wasnt a fan of the way he sits in the seat it seems like he is way too far us right, but overall I would definitely reccomend this to a friend! Absolutely love this stroller and carseat set. The stroller is sooo light weight and spacious. It can lay all the way down, which is nice for younger babies. Very easy to but together and put away. takes very little space in trunk. Also love the additional board that can be click on the back for older children. great & comfortable stroller. Easy to manuever and the ride along board is perfect for my toddler once baby #2 arrives. The toddler seat also seems very comfortable just wish it came with a snack tray. And the sunshade and car seat canopy work perfectly together to block out any sun or wind. The infant car seat on the other hand is a little narrow and might not last for a chubby baby. But overall the carseat still seems very comfortable. I am expecting my 4th baby in November, and I have had my fair share of strollers. The Sibby Travel System is probably the most convenient stroller that I have owned, due to the fact that it comes with a ride-along board! How cool is that?! I tried it out with my son, unfortunately he's only 20 months so he's too little to understand to stand and hold on while I push the stroller, but my 6 year old thought it was a cool skateboard. 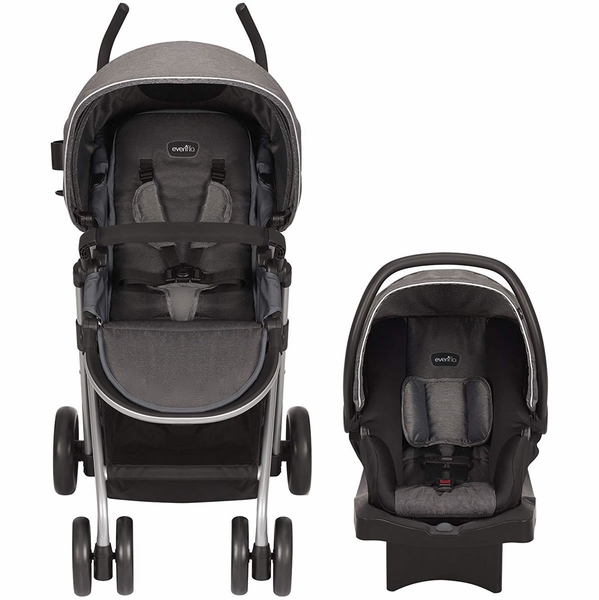 The travel system is more on the smaller ones that I have owned, and lighter. It's easy to open and close. A neat feature it has is a 3 position foot rest. So when the baby gets older, I can adjust the foot rest if the baby falls asleep and have him be more comfortable in it. The bottom basket appears to be about average size, enough to fit a diaper bag under. I do like how the canopy is long, so it can protect the baby from the sun better. Sometimes, the canopy on other strollers that I have owned was not long enough and I have to use a blanket. Comfort wise, I'm not sure yet if the baby will be comfortable in the car seat. I'll soon find out! LOVE the one-handed fold. It's very lightweight, easy to maneuver, and the car seat snaps right in. My tot loves the glider board feature as well. Giant underbin storage!